It was an occasion few in the corporate world would miss being part of. 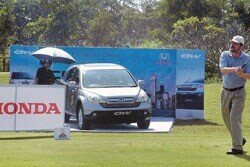 The annual Business Today-Honda Pro-Am has created such a buzz that they make sure they are there. Their excitement was visible on November 17, Saturday, when 80 of them descended at the Eagleton Golf Club on the outskirts of Bangalore to participate in the first of the three regional rounds of the 13th edition of the event. The day turned out to be just perfect, as some golfers told BT later. What better way to start off one’s weekend than to drive away from a concrete jungle and into a wooded world and lose oneself in the nature. Indeed, the golf course at Eagleton was an ideal place to chill out. Freshly showered after a game of over four hours, Ravi Naware, CEO, ITC Foods exuded ample charm as he blissfully chatted away with his friends and colleagues. A visibly pleased Airtel’s L.V. Sastry declared that he wouldn’t have missed the opportunity for anything. A vice president at India’s largest telco, Sastry said he always looked forward to the event. “Weconsider it a prestige to be invited. Year after year, Corporate India’s most avid golfers look forward to the Pro-Am, which is by now a brand in its own right. The event also offers a great opportunity for business networking. One could see players from different companies and backgrounds bond so well.” Sastry, who heads Airtel’s operations in Karnataka, said: “BT Pro-Am is the largest, amateur and standalone event in India. But it is always conducted like a professional tournament”. This was Sastry’s fifth consecutive outing at the Pro-Am. Honda’s South Zonal Head A.V. Prabhu Kumar, whose company is celebrating its 10th anniversary in India, had to juggle anniversary responsibilities with golf. He was busy addressing dealers in Coimbatore on Friday, but caught the first available flight the next morning to be part of the event. “This time people enjoyed it thoroughly,” said the man, whose company organised the event along with BT. For Sanjay Diwan, Director, Global Accounts, Avaya, it was a great experience to be part of golf, which, he said, has a great position in market place. Post the game and a quick shower, as the participants gathered for drinks and a sumptuous lunch, they indulged in a friendly banter and a guessing game on who could be the lucky three to fly to Delhi for the grand finale. Finally, the organisers announced that Arjun Srivatsa had pipped former India International David D’Souza (MD, Garden City Fashions) to reach the national finals. Both Srivatsa and D’Souza had ended with 36 stableford points in the 0-8 handicap category. But Srivatsa pipped D’Souza on a count back of the last nine holes. The others who made it to the finals to be held in Delhi in February included Vishal Bhat (MD, MNS Exports), who pipped Raj Krishna (MD, SL Constructions) on countback in the 9-16 handicap category after having logged 39 stableford points, and Vineet Kshirsagar (Director, Oracle) from the 17-24 category after scoring 37 stableford points. The team honours went to the quartet of Shane O’Neil, Vishal Bhat, Sumit Rathor and H.W. Kim, who narrowly beat the team of G.S. Ravi, Nandan Heblikar, Desmond Rice and Vineet Kshirsagar. Business Today’s Publishing Director Pavan Varshnei, Honda’s Prabhu Kumar and Avaya’s Diwan gave away the prizes amidst cheers from the crowd. The next regional round will be held at the Tollygunge Golf Course in Kolkata on December 15. At the end of the Bangalore round, Varshnei said he found the response from participants very encouraging. “It’s a pinnacle event for corporate heads across India. It’s like a calendar event,” he said, adding that the turnout this year was larger than in the past. “It (Pro-Am) is gaining in popularity and stature along with the game. All the leading CEOs come. I see a lot of new faces,” he said. BT Pro-Am was supported by ITC-Welcomgroup and Avaya Global Connect. The prize sponsors were South African Airways and Sun International.